I was so completely uplifted when I read an interview that Canadian House + Home conducted recently with husband and wife team John Booth and Arounna Khounnoraj of Bookhou Design in Toronto. (If you happen to stop by your local bookseller, pick up a copy of the July issue and refer to page 40.) Not only am I fascinated with couples who work and design together, but I love how Bookhou gives a fresh organic twist to contemporary wares, warming up the often stark interiors that you find in so many contemporary homes. 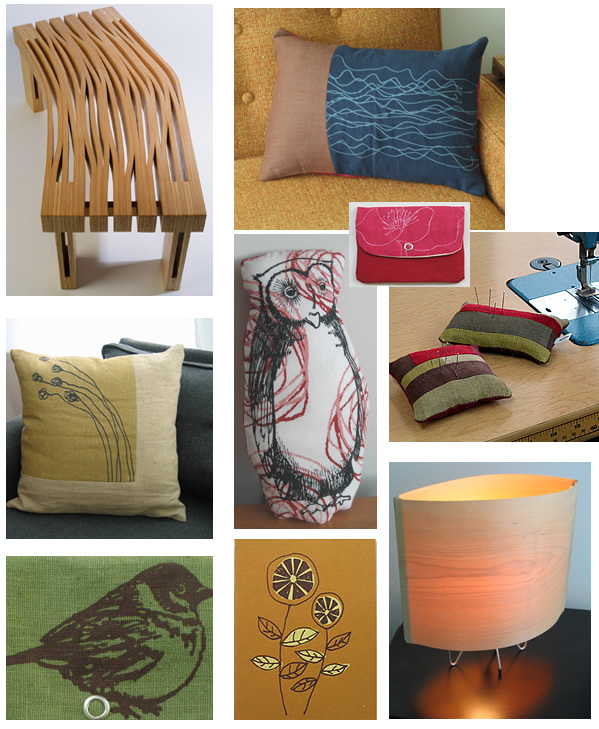 Thier work always begins as art, yet it evolves into these tactile, beautiful and very affordable utilitarian objects. What a creative couple! John, a painter and an architect, crafts chairs, lamps, beautiful wood tables that double as benches, and paintings. Arounna, with a background in fine art, sculpts and silkscreens her drawings of flowers, trees and birds on a variety of textiles to create handbags, wallets, pillows, aprons, greeting cards, and is currently experimenting with creating diaper bags and a line of table linens. Talk about having your hands in everything... Amazing! 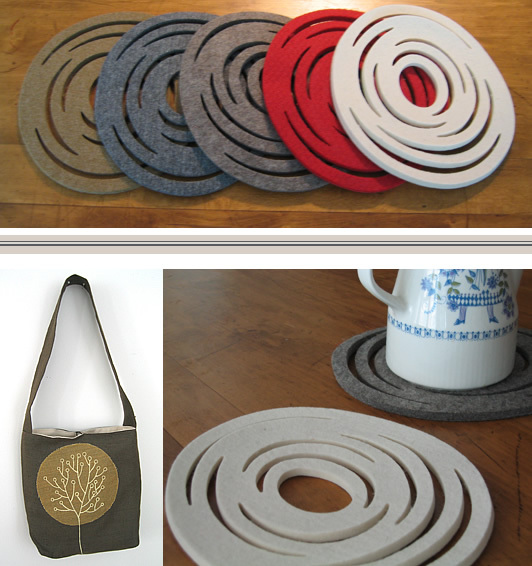 I just love their felt trivets and Arounna's white felt wall installations. Wouldn't they be lovely arranged on a wall? You could purchase several and display them in a semi-circle or swirly pattern, perhaps cascading down from the corner of your ceiling (with one actually on your ceiling), creeping down in a swirly pattern to the top of your credenza, where you place another trivet on the surface. The trivets are also a nice way to add circles (and dimension) to your walls if you're not into decals and you don't like the look of plates.